224 pp., 135 color ills. Exhibition schedule: The Huntington Library, Art Collections, and Botanical Gardens, San Marino, CA, January 24, 2015–—May 4, 2015; Amon Carter Museum of American Art, Fort Worth, TX, May 23, 2015–—August 23, 2015; Seattle Art Museum, Seattle, WA, October 1, 2015–—January 10, 2015; Crystal Bridges Museum of American Art, Bentonville, AR, January 23, 2016–—April 18, 2016; Detroit Institute of Arts, Detroit, MI, June 18, 2016–—September 18, 2016; Peabody Essex Museum, Salem, MA, October 8, 2016–—January 8, 2017; Reynolda House Museum of American Art, Winston­-Salem, NC; February 16, 2017–—June 14, 2017; New Britain Museum of American Art, New Britain, CT, June 17, 2017–—October 15, 2017; Iris & B. Gerald Cantor Center for the Visual Arts at Stanford University, Stanford, CA, November 15, 2017–—March 18, 2018. It is no accident that Samuel F.B. Morse’s Gallery of the Louvre has come to stand as perhaps the signature work in the Terra Foundation’s collection of American Art. A painting about travel, international encounters, public education and enlightenment, and the transformative power of communication is an apt metaphor for a foundation that today sponsors similar activities and strives, according to a phrase from its mission statement, to “further cross-cultural dialogue on American art.”1 Samuel F.B. 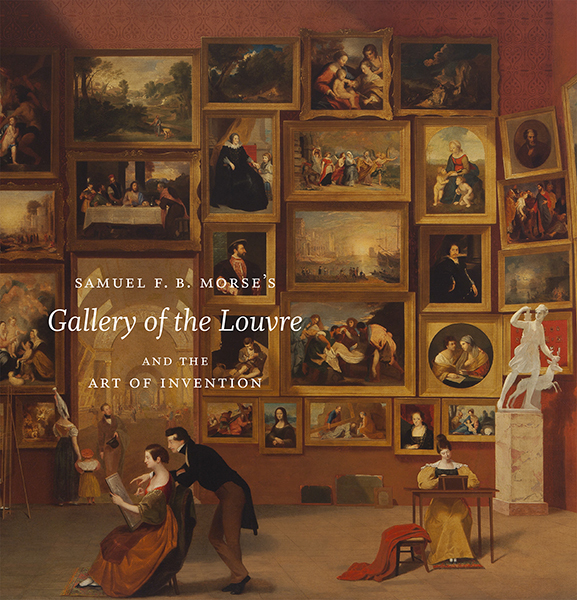 Morse’s Gallery of the Louvre and the Art of Invention is the culminating publication that caps off a multi-year series of intensive engagements with the painting that included a much needed conservation treatment, a video documentary, a symposium, scholarly study days, and a multi-venue exhibition that exposed the painting to an exponentially larger audience than the paltry few that first viewed the completed painting in New York and New Haven in 1833 and 1834. The dedication of so much attention and resources to a single painting, one that was in its time an epic commercial failure that hardly anyone actually saw, is a risky proposition. The scale of the project is readily apparent in the Acknowledgements where the book’s editor, Peter John Brownlee, thanks no less than 50 individuals and five major institutions. But the resulting volume represents a significant return on those collective investments. Under Brownlee’s guidance, the essays—despite the requisite choreography of edits, revisions, and re-workings that attend all exercises in scholarly publication—nonetheless retain the freshness and spontaneity of a direct collaborative appraisal and appreciation of the painting by a group of colleagues and friends. The tone of the essays is scholarly but conversational and preserves the excited intellectual curiosity and joy of discovery that no doubt animated the series of on-the-spot study days spent before the painting itself. The illustrations are lavish, and include a reprinting of Morse’s original catalogue, a contemporary diagram of the contents of the picture, and full page high-resolution details that divide each section of the book. In addition to a Selected Bibliography, the volume features a helpful timeline that situates the creation of the painting within Morse’s own life and career, and alongside a series of contextual milestones, many of which are referenced by the authors in the preceding essays. Brownlee’s introduction to the volume ably summarizes most of the main avenues of inquiry that structure the subsequent essays, and provides a useful primer on Morse’s life the conditions of the painting’s creation. Readers are presented a view of Morse’s output as a holistic and interconnected network of productions best understood through their mutual intelligibility. While The Gallery of the Louvre itself features prominently here, Brownlee’s cogent and concise outline of its relationship to Morse’s aesthetic philosophy, in particular the distinction Morse makes between mechanical and intellectual imitation, resonates through the rest of the book. The essay justifies the importance of the painting, despite its lack of popular appeal, as a grand and well-digested visual summa of artistic, philosophical, political, and social influences that would fuel Morse’s subsequent and significantly more profitable achievements. The essays of Andrew McClellan and Catherine Roach both investigate the careful choices made by Morse in his conception of The Gallery of the Louvre as they relate to the configuration of the museum at the time. McClellan investigates the context of the Louvre as a key site for copying, artistic appropriation, and emulation and makes particular note of Morse’s decision to ignore the museum’s installation according to a taxonomy of national schools as well as the artist’s focus upon the genteel and dignified appreciation of the collection by a select few rather than the hordes of visitors that normally occupied the museum’s galleries when they were open to the public. Roach relates Morse’s picture to the history of Gallery Painting, a highly subjective and malleable genre where the presence and position of artworks were often manipulated to achieve a desired effect. She argues convincingly for a more prominent connection between the nationalist ambitions of Morse’s picture and that of John Scarlett Davis’s The Salon Carré and the Grand Gallerie of the Louvre, 1831 (1831) which she discovers to have not seven, as had been previously believed, but nine paintings in common. While McClellan and Roach focus on European traditions that inform the painting, Rachael Z. DeLue and Tanya Pohrt relate Morse’s project to [largely] American cultural and scientific models and exhibition practices. DeLue convincingly argues that the painting’s conception relates to three key practices: natural history illustration and display, cartography, and Morse’s own writing. To this end she teases out resonances between the spatial recession of the gallery and the reductive frames of the pictures in Morse’s painting with similar features in Charles Willson Peale’s The Artist in His Museum (1822); considers Morse’s painting as an exercise in diagrammatic mapping, a practice gleaned from the artist’s father Jedidiah Morse, a noted American Geographer; and notes how viewers would have experienced the exhibition of the picture as a carefully orchestrated interplay between the painting itself and the text of the descriptive catalogue that accompanied it. The result is a fresh understanding of The Grand Gallery of the Louvre as something akin to a collection of carefully chosen and prepared specimens gleaned from Morse’s Trans-Atlantic expedition. Pohrt reveals how Morse’s hopes for the successful and profitable exhibition of such a picture before the American public was fraught with marketing blunders and overwhelmed by strong competition. The sober erudition offered by the painting stood no chance against larger, more spectacular and compelling pictures that offered, in Pohrt’s words, the “pleasures of vicarious escape” (80). Morse’s interests in sculpture and photography respectively structure the subsequent pair of essays by Wendy Bellion and Sarah Kate Gillespie. Bellion begins her analysis by noting the relative absence of sculpture in Morse’s picture. There are only two, they are visually overwhelmed by the paintings, and neither is even identified in Morse’s Descriptive Catalogue. But the author diagnoses this oversight as a symptom of Morse’s concurrent and over-indulgent acquisition of plaster casts for the National Academy of Design in New York, a purchase whose associated shipping costs put the institution, then under Morse’s charge, in severe financial peril. Bellion explains how sculpture played an important role in Morse’s artistic practice, particularly through his relationship with the sculptor Horatio Greenough, a friend of the artist who appears as a figure in The Gallery of the Louvre. Whereas most authors in the volume make much of Morse’s penchant for intellectual rather than mechanical imitation, Gillespie makes a case for the importance of Morse’s enduring interest in the latter as evidenced by his pioneering work on Daguerreotype production in the United States. She adroitly demonstrates that Morse’s artistic and scientific interests were not separate, but intricately intertwined endeavors by highlighting a common compositional structure that the artist imparted to both The Grand Gallery of the Louvre and his daguerreotype Still Life (1840), produced in partnership with John William Draper. Like Gillespie and DeLue, Jean-Philippe Antoine productively muddles the boundaries between Morse’s artistic and scientific interests. He considers The Gallery of the Louvre as an act of communication, a visual investigation of the possibility of the instantaneous and lossless transmission of information. Antoine aligns the re-appropriation of old masters into a new configuration on the surface of the painting with a similar adaptive process that Morse deployed upon technological innovations that he had witnessed in Paris and elsewhere and that he would, beginning on his voyage back to the United States, rework into his idea for the electromagnetic telegraph. While Antoine acknowledges and delineates the ambition in Morse’s painting towards seamless communication and visual transport, he finds the project undermined by the fact that, as the author puts it, “it was—and still remains, to this day—impossible to telegraph a painting” (121). While technically true, in an age of 3-D Printing and near-perfect replication, this is a fascinating and complicated claim. In the end, telegraphy co-opts from painting Morse’s desire for instantaneous mechanical transmission, leaving the latter medium as a more appropriate site for the depositing of memory and subjective experience, as Antoine’s effective comparison of The Gallery of the Louvre with Courbet’s The Artist’s Studio (1854-55) makes clear. Richard Read’s essay finds Morse’s oscillations between science and art, and mechanical and intellectual imitation, animated the Puritan notion of Technologia, which maintained the indivisibility of the arts and sciences. The main body of the essay delineates a mechanics of binary on/off progressions and impedances that structure the painting’s composition. This exercise transforms The Gallery of the Louvre into something like an electronic circuit, a carefully calibrated visual apparatus rather than a mere painting. As a result, Read’s illustration of Morse’s “Canvas Stretcher” Telegraph (1837) may be understood by his readers as something more like a proto-constructivist sculpture than a pure machine. The author argues that these entanglements between art and science remain palpable in the painting despite the Louvre’s isolation of art from science, a departure from the Wunderkammer tradition of hybridized installations that continued to structure most American museums at the time. More than any other author in the book, David Bjelajac takes seriously the particular nuances of meaning generated by Morse’s careful selection and orientation of paintings within The Gallery of the Louvre. He argues that the contradiction between Morse’s simultaneous fascination with and disdain for Catholic imagery is rectified by what the author calls the artist’s “cargo-boxing of miniature copies for export to America” that “discourages idolatrous focus upon any one magic working icon” (149). Bjelajac proposes a densely networked picture understandable through a complex and intensive reading of typological resonances that derive from alchemy, freemasonry, scripture, and—most convincingly—theological debates between Trinitarian and Unitarian interpretations of divinity. Bjelajac does an excellent job laying out the existence of and motivations for these connections, but one wonders if any of the visitors to the short-lived exhibitions of the picture in New York and New Haven would have possessed the impressive theological chops necessary to make them. Morse’s succinct, matter-of-fact guide to the picture makes no mention of these meanings, which may suggest that the full breadth of such interpretations were intended to be carried out by a very specific audience. The inability of The Gallery of the Louvre to connect with its audience is taken up by Alexander Nemerov in the penultimate essay in the book. In his refreshingly frank critique, he pulls no punches. In the painting, Nemerov writes, “big has become small; passion and struggle have become the mildness of a mere cultural literacy: the old masters have been belittled” (172). The copies in Morse’s picture are by necessity relatively crude reductions of their original sources. Yet, as the author puts it, “the big mistake Morse’s painting makes is to give the viewer a clue that this more urgent world of art and life does exist—perhaps everywhere except in Morse’s painting itself” (173). Nemerov finds the picture’s emotional intensity and gravitas lacking when compared the artist’s earlier Dying Hercules (1812-13), or John Ferguson Weir’s The Gun Foundry (1866), with its similar focus upon raw material ready to be reinterpreted and re-cast into new forms. Whereas The Gallery of the Louvre was intended by Morse to stand in for actual travel and experience, Nemerov finds the painting to be no substitute for an on-site encounter with a real old master painting, or for the haunting, heavy presence of a real place. Situated near the end of the volume, this indictment shines like a light finally, at long last, cast upon an elephant in the room. The failure of Morse’s picture is an undeniable part of its history, and the book’s editor, Peter John Brownlee, deserves credit for allowing that story to be told. The absence of chiaroscuro in The Gallery of the Louvre discussed by Nemerov is made even more apparent when readers learn from the final essay, written by conservators Lance Mayer and Gay Myers, that the painting had even less of it when it was finished and exhibited by Morse in 1833 and 1834. Morse’s addition of varnish to his paints to increase the speed at which his canvas dried, lends credence to the presentation of Morse in the earlier study Jean-Philippe Antoine by as a man obsessed with the velocity of artistic and technological communication. This technique was not, as Morse and others at the time surmised, one actually used by the old masters. In an ironic twist—one amplified by Nemerov’s arguments that directly precede their essay—Mayer and Myers reveal that “the actual sixteenth- and seventeenth-century paintings in the Louvre have lasted much better than Morse’s nineteenth-century copies of them” (189). By focusing the attention of twelve scholars upon a single work of art, Samuel F.B. Morse’s Gallery of the Louvre and the Art of Invention offers many new vantage points for understanding the picture and the issues with which it was deeply involved. Morse’ painting and his telegraph with their twin yearnings for modes of lossless communication and ersatz experience, raise issues that are readily applicable to the present day, a time beset by the promises and perils of a new generation of virtual realities and communication technologies that the innovations of Morse himself helped bring about. The book’s lively essays encourage readers to compare and contrast their authors’ varying points of view, to tease out resonances, correspondences, and distinctions, in much the same way that viewers, then and now, might make sense of the grand visual anthology in Morse’s Salon Carré. About the Author(s): Guy Jordan is Associate Professor of Art History at Western Kentucky University.